A third helping of hidden object fun! Why stop at having seconds? 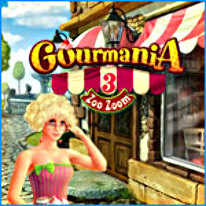 Dig into a third helping of hidden object fun in Gourmania 3: Zoo Zoom! Help Victoria patch things up with her estranged father by launching a chain of exotic restaurants. Find the ingredients for spicy fajitas at Tres Amigos, or prepare a mouthwatering Greek Salad at Aesop's Tables! From pouring hot java at Bean Me Up to serving ice-cold treats at Beaches and Cream, there's never a dull moment as you work quickly to please your customers and increase your profits!